What would your life be like if money was no more or less frightening to you than a wooden log or a can of paint? Reduce your financial anxiety by 75% or more. Move beyond every single belief and superstition you may have around money, regardless of how deeply engrained they may seem to be. Master the money game as a game — from creating to accumulating to managing to using your money to create even more of what you want in your life. 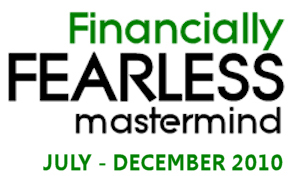 Financially Fearless is a six-month mastermind experience specially designed by supercoaches Steve Chandler (stevechandler.com) and Michael Neill (geniuscatalyst.com) to take you and a small group of your peers beyond your current limitations and fears around money. Over the course of our time together, you will learn to bring your best self to bear on any aspect of life that is currently undermined by money worry and money "problems." This instensive, highly-interactive three day experience will be followed up immediately by your online participation in a private, members-only 24/7 Fearless Coaching Forum, hosted by Steve Chandler with regular visits by Michael Neill. This forum will provide fierce coaching and commentary and profound sharing of daily breakthroughs produced by you and your mastermind partners. In between each of the live sessions, you'll be carefully paired up with an appropriate mastermind member for a weekly coaching call on the power of building inner peace and prosperity. Throughout the course, you'll learn key principles, strategies and insights that will help you transform your relationship with money and begin living your life independent of financial concerns. 1. How to create more of it. 2. How to not be afraid of it. 3. How to create a quickening around it, bringing the impossible dreamy-secure financial future INTO THIS PRESENT MOMENT. The price of the six-month training is $10,000, which includes all materials and lunch for each of the live training days. If you are ready to become Financially Fearless, click here to reserve your place. Michael Neill is an internationally renowned success coach and the best-selling author of You Can Have What You Want, Feel Happy Now! and the Effortless Success audio program. He has spent the past 20 years as a coach, adviser, friend, mentor and creative spark plug to celebrities, CEO's, royalty, and people who want to get more out of their lives. His books have been translated into 8 languages, and his public talks and seminars have been well received at the United Nations and on five continents around the world. He hosts a weekly talk show on HayHouseRadio.com®, and his newest book, Supercoach: 10 Secrets to Transform Anyone's Lifewill be released by Hay House in March, 2010. Drawing on more than 20 years of working with professionals to dramatically improve their success, Steve Chandler and the “MindShift” he offers frees people from unnecessary pessimism and puts them back in touch with the source of their enthusiasm for work and life. Although Steve Chandler graduated from the University of Arizona with a degree in Creative Writing and Political Science, and spent four years in the military studying language and psychological warfare; he credits his own life experiences with failure as the most valuable tools for helping others. Steve’s audiences are inspired by stories of his “low points” – it gives them hope, because they realize that they are not nearly as bad off as he was – they figure if Steve can transform his life, so can they! Steve Chandler is now the author of 20 books that have been translated into over 20 languages. His personal success coaching, public speaking and business consulting have been used by CEOs, top professionals, major universities, and over 30 Fortune 500 companies. He has twice won the national Audio of the Year award from King Features Syndicate. A popular guest on TV and radio talk shows, Steve Chandler has recently been called "the most powerful public speaker in America today."